On April 18th 1988, the Conservatory moved in the entirely renovated premises of the previous Veterinary School of Lyon, on the side of the Saone River at the 3 quai Chauveau, in the 9th district. During more than three hundred years, this antique building’s walls have successively homed nuns, future veterinary doctors, and now musicians and dancers. Fortuitous discoveries, followed by systematised excavations, led to the uncovering of various works, including a Latin description mentioning thermal baths. Moreover, a small building that used to be called the “two lovers’ tomb”, situated near the Quay until 1707, gave its name to the area where was later constructed the Veterinary School. The site’s southern part, currently delimited by the Quai Chauveau and the Montée de l’Observance, was occupied around the 12th century by a hospital depending on the Saint-Paul Collegiate, which was deleted by Pope Alexander VI. The property returned to the royal estate. The following year, in 1493, the property was given by the king Charles VIII to a Franciscan monk, brother Bourgeois, who was very keen to found a convent there. The priest’s purpose was to reform the Order of the Corderliers and to come back to the strict following of Saint Francis’ order. The restoration of the site was finished in 1496 and included a little gothic church and conventual buildings. It was partially destroyed in 1562 by Protestants and rebuilt and enhanced through the following centuries (several chapels were added). In 1652, nuns of Sainte-Elisabeth acquired the land situated at the North of the convent of the Cordeliers de l’Observance to develop their community of Bellecour. From 1675 onwards, they undertook the building of a new monastery. On the current façade remains a plate dated of July 7th 1675, which commemorates the laying of the first stone by the Archbishop of Lyon, Camille de Neuville. On the eve of the Revolution, the Sainte-Elisabeth convent had 37 nuns. The building was seized as a national property and sold to private people while the State kept the whole monastery. In accordance with the decree of April 25th 1795, the Veterinary school, which had been recently created (in 1762) by Bourgelat, was transferred from the Guillotière district to the Sainte-Elisabeth convent. Several architects were entrusted with the building. Their missions oscillated between maintenance and transformation projects, in order to follow the development of the Veterinary school. Claude Ennemond Cochet was the first to be charged with the new school’s establishment, from 1795 to 1807. Louis Cécile Flachéron then established an ambitious program of which he only got to realise some components, due to a lack in funding. Antoine Marie Chenavars followed in 1822. Thanks to new funding, he took over and completed the projects that his predecessors had postponed. He undertook demolitions and extended the buildings. He created a beautiful symmetrical composition that opened on the river, contrary to the previous arrangements that were closed to the water. To fence in the building, he imported a fence from the Castle of La Balme. While the building work was done, the veterinary students were temporarily put in the convent of the Corderliers. The State and the city appeared unsure about the allocation of these premises. The Veterinary School, on the other hand, needed them to answer the increase in its numbers and activities. Pierre Prosper Chabrol was appointed in 1839. He also undertook projects of restructuration and extension, such as the creation of a semi-circular amphitheatre, following the direction his predecessor had taken. New agreements were drawn between the city, the State and the clergy, which led Chabrol to rethink his plans with two properties (the Observance grounds were acquired). The definitive project was presented in 1847 and was only scarcely changed until its completion. Chabrol’s work, due to its scale, its homogeneity and its genius, indisputably marked the site in a permanent way. His followers tried to adapt the premises to the new functions the veterinary sciences were discovering at the time. It was the case of Sainte-Marie Perrin, Tony Garnier, France Pierre Bourdeix. All the work they did, which was realised at the cost of Chabrol’s initial project’s homogeneity, could not answer the needs of the school, which therefore moved in 1978 in new premises build to that end on the Marcy l’Etoile plateau. See here this period in pictures. After the Veterinary school’s departure, the property was split in two again. The Ministry of Culture was given the main building, the courtyards, the gardens, while the Ministry of Agriculture kept the additional buildings, in which regional administrative services were set up. Meanwhile, the Conservatory became operational in 1979. Its students were received in temporary premises rue de l’Angile before its permanent establishment quai Chauveau. To this end, the Ministry of Culture launched an architect’s consultation in 1982, which Espace Construit (H.M Duplantier, E. Gallet, P.A Lablaude, E. Rey) won. The plans concerned the arrangement of two hectares of terrain, of which more than a half were on a wooded hill, as well as the reinstatement of 12 000m2 of premises to which was needed the addition of a building of 3 000 m2. The current site is located between the River and the Fourvière hill, which was cut in order to build a patio. The old building is organised around a central courtyard enclosed in a cloister. The new building overlaps the retaining structure and is joined to the building by a glass link. Its main façade opens on the Plane Tree Courtyard, while a lateral façade is on the same level as the patio garden. 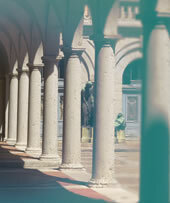 Since 1992 and in order to fit the creation of a new department (dance), the Conservatory has been given a second site. It is located on the other side of the Saone River, in the Grenier de l’abondance, a wheat granary build during the first half of the XVIIIth century. It occupies the third floor of the building, which is also home to the Regional Direction of Cultural Affairs of the Rhône-Alpes Region. From this moment on, the two buildings have been as a whole the CNSMD of Lyon, symbolically divided by the Saone. They are numerous and diverse, delimited by the buildings. They adjoin one another by a series of paths and stairs. Each of them has benefited from its own landscape design, realised according to its original character and its new given vocation.